The Calculator language provides a means of combination through nested call expressions. However, there is no way to define new operators, give names to values, or express general methods of computation. In summary, Calculator does not support abstraction in any way. As a result, it is not a particularly powerful or general programming language. We now turn to the task of defining a general programming language that supports abstraction by binding names to values and defining new operations. Rather than extend our simple Calculator language further, we will begin anew and develop an interpreter for the Logo language. Logo is not a language invented for this course, but instead a classic instructional language with dozens of interpreter implementations and its own developer community. Unlike the previous section, which presented a complete interpreter as Python source code, this section takes a descriptive approach. The companion project asks you to implement the ideas presented here by building a fully functional Logo interpreter. > Programming languages should be designed not by piling feature on top of feature, but by removing the weaknesses and restrictions that make additional features appear necessary. Scheme demonstrates that a very small number of rules for forming expressions, with no restrictions on how they are composed, suffice to form a practical and efficient programming language that is flexible enough to support most of the major programming paradigms in use today. We refer you to this Report for full details of the Scheme language. We&apos;ll touch on highlights here. We&apos;ve used examples from the Report in the descriptions below.. Despite its simplicity, Scheme is a real programming language and in many ways is similar to Python, but with a minimum of "syntactic sugar". Basically, all operations take the form of function calls. Here, we will describe a representative subset of the full Scheme language described in the report. There are several implementations of Scheme available, which add on various additional procedures. At Berkeley, we&apos;ve used a modified version of the Stk interpreter, which is also available as stk on our instructional servers. Unfortunately, it is not particularly conformant to the official specification, but it will do for our purposes. Values in Scheme. Values in Scheme generally have their counterparts in Python. > Booleans > > The values true and false, denoted #t and #f. In Scheme, the only false value (in the Python sense) is #f. > > Numbers > > These include integers of arbitrary precision, rational numbers, complex numbers, and "inexact" (generally floating-point) numbers. Integers may be denoted either in standard decimal notation or in other radixes by prefixing a numeral with #o (octal), #x (hexadecimal), or #b (binary). > > Symbols > > Symbols are a kind of string, but are denoted without quotation marks. The valid characters include letters, digits, and: > > &gt; ! $ % & * / : &lt; = &gt; ? ^ _ ~ + - . @ &gt; &gt; > > When input by the read function, which reads Scheme expressions (and which the interpreter uses to input program text), upper and lower case characters in symbols are not distinguished (in the STk implementation, converted to lower case). Two symbols with the same denotation denote the same object (not just two objects that happen to have the same contents). > > Pairs and Lists > > A pair is an object containing two components (of any types), called its car and cdr. A pair whose car is A and whose cdr is B is denoted (A . B). Pairs (like tuples in Python) can represent lists, trees, and arbitrary hierarchical structures. > > A standard Scheme list consists either of the special empty list value (denoted ()), or of a pair that contains the first item of the list as its car and the rest of the list as its cdr. Thus, the list consisting of the integers 1, 2, and 3 would be represented: > > &gt; (1 . (2 . (3 . ()))) &gt; &gt; > > Lists are so pervasive that Scheme allows one to abbreviate (a . ()) as (a), and allows one to abbreviate (a . (b ...)) as (a b ...). Thus, the list above is usually written: > > &gt; (1 2 3) &gt; &gt; > > Procedures (functions) > > As in Python, a procedure (or function) value represents some computation that can be invoked by a function call supplying argument values. Procedures may either be primitives, supplied by the Scheme runtime system, or they may be constructed out of Scheme expression(s) and an environment (exactly as in Python). There is no direct denotation for function values, although there are predefined identifiers that are bound to primitive functions and there are Scheme expressions that, when evaluated, produce new procedure values. > > Other Types > > Scheme also supports characters and strings (like Python strings, except that Scheme distinguishes characters from strings), and vectors (like Python lists). > Integers, booleans, characters, strings, and vectors evaluate to themselves. Thus, the expression 5 evaluates to 5. > Bare symbols serve as variables. Their values are determined by the current environment in which they are being evaluated, just as in Python. > Non-empty lists are interpreted in two different ways, depending on their first component: > If the first component is one of the symbols denoting a special form, described below, the evaluation proceeds by the rules for that special form. > In all other cases (called combinations), the items in the list are evaluated (recursively) in some unspecified order. The value of the first item must be a function value. That value is called, with the values of the remaining items in the list supplying the arguments. > Other Scheme values (in particular, pairs that are not lists) are erroneous as programs. >>> 5              ; A literal. 33                  ; add function and * to primitive multiply. Primitive Special Forms. The special forms denote things such as control structures, function definitions, or class definitions in Python: constructs in which the operands are not simply evaluated immediately, as they are in calls. > EXPR-SEQ > > Simply a sequence of expressions, such as: > > &gt; (+ 3 2) x (* y z) &gt; &gt; > > When this appears in the definitions below, it refers to a sequence of expressions that are evaluated from left to right, with the value of the sequence (if needed) being the value of the last expression. > > BODY > > Several constructs have "bodies", which are EXPR-SEQ_s, as above, optionally preceded by one or more Definitions. Their value is that of their _EXPR-SEQ. See the section on Internal Definitions for the interpretation of these definitions. Internal Definitions. When a BODY begins with a sequence of define constructs, they are known as "internal definitions" and are interpreted a little differently from top-level definitions. Specifically, they work like letrec does. > First, bindings are created for all the names defined by the define statements, initially bound to undefined values. > Then the values are filled in by the defines. Predefined Functions. There is a large collection of predefined functions, all bound to names in the global environment, and we&apos;ll simply illustrate a few here; the rest are catalogued in the Revised(4) Scheme Report. Function calls are not "special" in that they all use the same completely uniform evaluation rule: recursively evaluate all items (including the operator), and then apply the operator&apos;s value (which must be a function) to the operands&apos; values. Logo is another dialect of Lisp. It was designed for educational use, and so many design decisions in Logo are meant to make the language more comfortable for a beginner. For example, most Logo procedures are invoked in prefix form (first the procedure name, then the arguments), but the common arithmetic operators are also provided in the customary infix form. The brilliance of Logo is that its simple, approachable syntax still provides amazing expressivity for advanced programmers. The central idea in Logo that accounts for its expressivity is that its built-in container type, the Logo sentence (also called a list), can easily store Logo source code! Logo programs can write and interpret Logo expressions as part of their evaluation process. Many dynamic languages support code generation, including Python, but no language makes code generation quite as fun and accessible as Logo. You may want to download a fully implemented Logo interpreter at this point to experiment with the language. The standard implementation is Berkeley Logo (also known as UCBLogo), developed by Brian Harvey and his Berkeley students. For macintosh uses, ACSLogo is compatible with the latest version of Mac OSX and comes with a user guide that introduces many features of the Logo language. You do not say what to do with 5. I do not know how to five. While 5 and five are interpreted differently, the Logo read-eval loop complains either way. The issue with the first case is that Logo complains whenever a top-level expression it evaluates does not evaluate to None. Here, we see the first structural difference between the interpreters for Logo and Calculator; the interface to the former is a read-eval loop that expects the user to print results. The latter employed a more typical read-eval-print loop that printed return values automatically. Python takes a hybrid approach: only non-None values are coerced to strings using repr and then printed automatically. You do not say what to do with 3. We can see from this nesting example that the parentheses and commas that delimit call expressions are not strictly necessary. In the Calculator interpreter, punctuation allowed us to build expression trees as a purely syntactic operation; without ever consulting the meaning of the operator names. In Logo, we must use our knowledge of how many arguments each procedure takes in order to discover the correct structure of a nested expression. This issue is addressed in further detail in the next section. The details of how to implement operator precedence and infix operators to form correct expression trees is left as an exercise. For the following discussion, we will concentrate on call expressions using prefix syntax. The point of this last example is to show that while the procedures sum and difference are not first-class constructs in Logo (they cannot be placed in a sentence, for instance), their quoted names are first-class, and the run procedure can resolve those names to the procedures to which they refer. The ability to represent code as data and later interpret it as part of the program is a defining feature of Lisp-style languages. The idea that a program can rewrite itself as it executes is a powerful one, and served as the foundation for early research in artificial intelligence (AI). Lisp was the preferred language of AI researchers for decades. The Lisp language was invented by John McCarthy, who coined the term "artificial intelligence" and played a critical role in defining the field. This code-as-data property of Lisp dialects, along with their simplicity and elegance, continues to attract new Lisp programmers today. Turtle graphics. No implementation of Logo is complete without graphical output based on the Logo turtle. This turtle begins in the center of a canvas, moves and turns based on procedures, and draws lines behind it as it moves. While the turtle was invented to engage children in the act of programming, it remains an entertaining graphical tool for even advanced programmers. The full repertoire of Turtle procedures is also built into Python as the turtle library module. A limited subset of these functions are exposed as Logo procedures in the companion project to this chapter. Any word that begins with a colon, such as :x, is called a variable. A variable evaluates to the value to which the name of the variable is bound in the current environment. The make procedure does not have the same effect as an assignment statement in Python. The name passed to make is either already bound to a value or is currently unbound. If the name is already bound, make re-binds that name in the first frame in which it is found. If the name is not bound, make binds the name in the global frame. This behavior contrasts sharply with the semantics of the Python assignment statement, which always binds a name to a value in the first frame of the current environment. The first assignment rule above is similar to Python assignment following a nonlocal statement. The second is similar to Python assignment following a global statement. Logo&apos;s application process for a user-defined procedure is similar to the process in Python. Applying a procedure to a sequence of arguments begins by extending an environment with a new frame, binding the formal parameters of the procedure to the argument values, and then evaluating the lines of the body of the procedure in the environment that starts with that new frame. While the name x is not bound in the global frame, it is bound in the local frame for print_x, the function that is called first. Logo&apos;s dynamic scoping rules allow the function print_last_x to refer to x, which was bound as the formal parameter of print_x. Dynamic scoping is implemented by a single change to the environment model of computation. The frame that is created by calling a user-defined function always extends the current environment. For example, the call to print_x above introduces a new frame that extends the current environment, which consists solely of the global frame. Within the body of print_x, the call to print_last_x introduces another frame that extends the current environment, which includes both the local frame for print_x and the global frame. As a result, looking up the name x in the body of print_last_x finds that name bound to 5 in the local frame for print_x. Alternatively, under the lexical scoping rules of Python, the frame for print_last_x would have extended only the global frame and not the local frame for print_x. A dynamically scoped language has the advantage that its procedures may not need to take as many arguments. For instance, the print_last_x procedure above takes no arguments, and yet its behavior can be parameterized by an enclosing scope. General programming. Our tour of Logo is complete, and yet we have not introduced any advanced features, such as an object system, higher-order procedures, or even statements. Learning to program effectively in Logo requires piecing together the simple features of the language into effective combinations. Parentheses are not necessary in Logo, but they often assist programmers in documenting the structure of nested expressions. Most dialects of Lisp require parentheses and therefore have a syntax with explicit nesting. This section describes the general structure of a Logo interpreter. While this chapter is self-contained, it does reference the companion project. Completing that project will produce a working implementation of the interpreter sketch described here. An interpreter for Logo can share much of the same structure as the Calculator interpreter. A parser produces an expression data structure that is interpreted by an evaluator. The evaluation function inspects the form of an expression, and for call expressions it calls a function to apply a procedure to some arguments. However, there are structural differences that accommodate Logo&apos;s unusual syntax. Lines. The Logo parser does not read a single expression, but instead reads a full line of code that may contain multiple expressions in sequence. Rather than returning an expression tree, it returns a Logo sentence. The parser actually does very little syntactic analysis. In particular, parsing does not differentiate the operator and operand subexpressions of call expressions into different branches of a tree. Instead, the components of a call expression are listed in sequence, and nested call expressions are represented as a flat sequence of tokens. Finally, parsing does not determine the type of even primitive expressions such as numbers because Logo does not have a rich type system; instead, every element is a word or a sentence. The parser performs so little analysis because the dynamic character of Logo requires that the evaluator resolve the structure of nested expressions. The parser does identify the nested structure of sentences. Sentences within sentences are represented as nested Python lists. A complete implementation of parse_line appears in the companion projects as logo_parser.py. Evaluation. Logo is evaluated one line at a time. 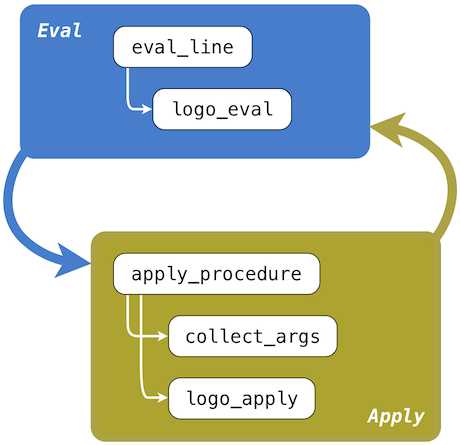 A skeleton implementation of the evaluator is defined in logo.py of the companion project. The sentence returned from parse_line is passed to the eval_line function, which evaluates each expression in the line. The eval_line function repeatedly calls logo_eval, which evaluates the next full expression in the line until the line has been evaluated completely, then returns the last value. The logo_eval function evaluates a single expression. The logo_eval function evaluates the different forms of expressions that we introduced in the last section: primitives, variables, definitions, quoted expressions, and call expressions. The form of a multi-element expression in Logo can be determined by inspecting its first element. Each form of expression as its own evaluation rule. A primitive expression (a word that can be interpreted as a number, True, or False) evaluates to itself. A variable is looked up in the environment. Environments are discussed in detail in the next section. A definition is handled as a special case. User-defined procedures are also discussed in the next section. A quoted expression evaluates to the text of the quotation, which is a string without the preceding quote. Sentences (represented as Python lists) are also considered to be quoted; they evaluate to themselves. A call expression looks up the operator name in the current environment and applies the procedure that is bound to that name. A simplified implementation of logo_apply appears below. Some error checking has been removed in order to focus our discussion. A more robust implementation appears in the companion project. """Evaluate the first expression in a line.""" The final case above invokes a second process, procedure application, that is expressed by a function apply_procedure. To apply a procedure named by an operator token, that operator is looked up in the current environment. In the definition above, env is an instance of the Environment class described in the next section. The attribute env.procedures is a dictionary that stores the mapping between operator names and procedures. In Logo, an environment has a single such mapping; there are no locally defined procedures. Moreover, Logo maintains separate mappings, called separate namespaces, for the the names of procedures and the names of variables. A procedure and an unrelated variable can have the same name in Logo. However, reusing names in this way is not recommended. Procedure application. Procedure application begins by calling the apply_procedure function, which is passed the procedure looked up by logo_apply, along with the remainder of the current line of code and the current environment. The procedure application process in Logo is considerably more general than the calc_apply function in Calculator. In particular, apply_procedure must inspect the procedure it is meant to apply in order to determine its argument count n, before evaluating n operand expressions. It is here that we see why the Logo parser was unable to build an expression tree by syntactic analysis alone; the structure of the tree is determined by the procedure. The apply_procedure function calls a function collect_args that must repeatedly call logo_eval to evaluate the next n expressions on the line. Then, having computed the arguments to the procedure, apply_procedure calls logo_apply, the function that actually applies procedures to arguments. The call graph below illustrates the process. The final function logo_apply applies two kinds of arguments: primitive procedures and user-defined procedures, both of which are instances of the Procedure class. A Procedure is a Python object that has instance attributes for the name, argument count, body, and formal parameters of a procedure. The type of the body attribute varies. A primitive procedure is implemented in Python, and so its body is a Python function. A user-defined (non-primitive) procedure is defined in Logo, and so its body is a list of lines of Logo code. A Procedure also has two boolean-valued attributes, one to indicated whether it is primitive and another to indicate whether it needs access to the current environment. A primitive procedure is applied by calling its body on the argument list and returning its return value as the output of the procedure. """Apply a Logo procedure to a list of arguments.""" 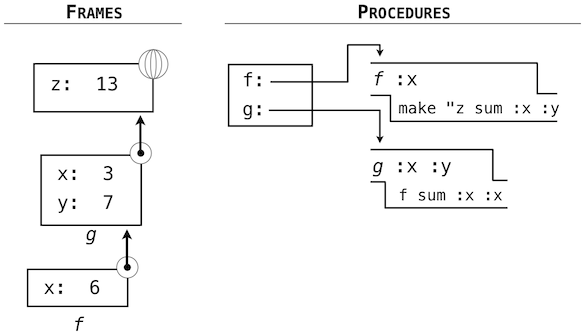 The body of a user-defined procedure is a list of lines, each of which is a Logo sentence. To apply the procedure to a list of arguments, we evaluate the lines of the body in a new environment. To construct this environment, a new frame is added to the environment in which the formal parameters of the procedure are bound to the arguments. The important structural aspect of this process is that evaluating a line of the body of a user-defined procedure requires a recursive call to eval_line. Eval/apply recursion. The functions that implement the evaluation process, eval_line and logo_eval, and the functions that implement the function application process, apply_procedure, collect_args, and logo_apply, are mutually recursive. Evaluation requires application whenever a call expression is found. Application uses evaluation to evaluate operand expressions into arguments, as well as to evaluate the body of user-defined procedures. The general structure of this mutually recursive process appears in interpreters quite generally: evaluation is defined in terms of application and application is defined in terms of evaluation. This recursive cycle ends with language primitives. Evaluation has a base case that is evaluating a primitive expression, variable, quoted expression, or definition. Function application has a base case that is applying a primitive procedure. This mutually recursive structure, between an eval function that processes expression forms and an apply function that processes functions and their arguments, constitutes the essence of the evaluation process. Now that we have described the structure of our Logo interpreter, we turn to implementing the Environment class so that it correctly supports assignment, procedure definition, and variable lookup with dynamic scope. An Environment instance represents the collective set of name bindings that are accessible at some point in the course of program execution. Bindings are organized into frames, and frames are implemented as Python dictionaries. Frames contain name bindings for variables, but not procedures; the bindings between operator names and Procedure instances are stored separately in Logo. In the project implementation, frames that contain variable name bindings are stored as a list of dictionaries in the _frames attribute of an Environment, while procedure name bindings are stored in the dictionary-valued procedures attribute. Frames are not accessed directly, but instead through two Environment methods: lookup_variable and set_variable_value. The first implements a process identical to the look-up procedure that we introduced in the environment model of computation in Chapter 1. A name is matched against the bindings of the first (most recently added) frame of the current environment. If it is found, the value to which it is bound is returned. If it is not found, look-up proceeds to the frame that was extended by the current frame. The set_variable_value method also searches for a binding that matches a variable name. If one is found, it is updated with a new value. If none is found, then a new binding is created in the global frame. The implementations of these methods are left as an exercise in the companion project. The lookup_variable method is invoked from logo_eval when evaluating a variable name. The set_variable_value method is invoked by the logo_make function, which serves as the body of the primitive make procedure in Logo. """Apply the Logo make primitive, which binds a name to a value.""" Assignment is only a limited form of abstraction. We have seen from the beginning of this course that user-defined functions are a critical tool in managing the complexity of even moderately sized programs. Two enhancements will enable user-defined procedures in Logo. First, we must describe the implementation of eval_definition, the Python function called from logo_eval when the current line is a definition. Second, we will complete our description of the process in logo_apply that applies a user-defined procedure to some arguments. Both of these changes leverage the Procedure class defined in the previous section. The first line of the definition supplies the name factorial and formal parameter n of the procedure. The line that follows constitute the body of the procedure. This line is not evaluated immediately, but instead stored for future application. That is, the line is read and parsed by eval_definition, but not passed to eval_line. Lines of the body are read from the user until a line containing only end is encountered. In Logo, end is not a procedure to be evaluated, nor is it part of the procedure body; it is a syntactic marker of the end of a procedure definition. The Procedure instance created from this procedure name, formal parameter list, and body, is registered in the procedures dictionary attribute of the environment. In Logo, unlike Python, once a procedure is bound to a name, no other definition can use that name again. The logo_apply function applies a Procedure instance to some arguments, which are Logo values represented as strings (for words) and lists (for sentences). For a user-defined procedure, logo_apply creates a new frame, a dictionary object in which the the keys are the formal parameters of the procedure and the values are the arguments. In a dynamically scoped language such as Logo, this new frame always extends the current environment in which the procedure was called. Therefore, we append the newly created frame onto the current environment. Then, each line of the body is passed to eval_line in turn. Finally, we can remove the newly created frame from the environment after evaluating its body. Because Logo does not support higher-order or first-class procedures, we never need to track more than one environment at a time throughout the course of execution of a program. The environment created from the evaluation of these expressions is divided between procedures and frames, which are maintained in separate name spaces. 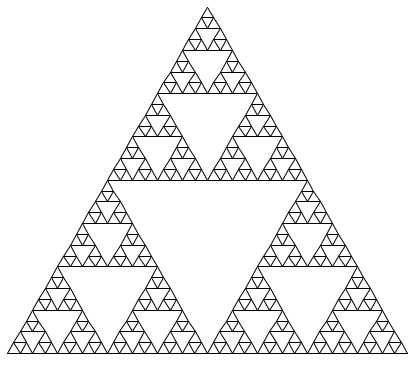 The order of frames is determined by the order of calls. We could express an equivalent program in Python as well, using a conditional expression. We may regard this program as the description of a machine containing parts that decrement, multiply, and test for equality, together with a two-position switch and another factorial machine. (The factorial machine is infinite because it contains another factorial machine within it.) 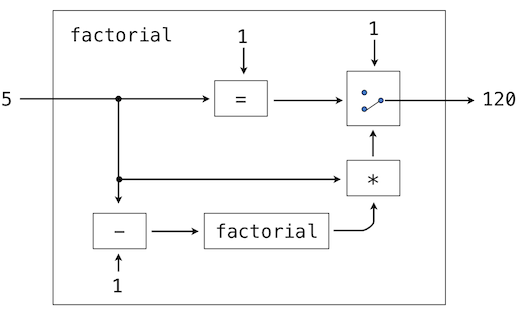 The figure below is a flow diagram for the factorial machine, showing how the parts are wired together. In a similar way, we can regard the Logo interpreter as a very special machine that takes as input a description of a machine. Given this input, the interpreter configures itself to emulate the machine described. For example, if we feed our evaluator the definition of factorial the evaluator will be able to compute factorials. From this perspective, our Logo interpreter is seen to be a universal machine. It mimics other machines when these are described as Logo programs. It acts as a bridge between the data objects that are manipulated by our programming language and the programming language itself. Image that a user types a Logo expression into our running Logo interpreter. From the perspective of the user, an input expression such as sum 2 2 is an expression in the programming language, which the interpreter should evaluate. From the perspective of the Logo interpreter, however, the expression is simply a sentence of words that is to be manipulated according to a well-defined set of rules. both return the same result. Evaluating expressions that are constructed as a part of execution is a common and powerful feature in dynamic programming languages. In few languages is this practice as common as in Logo, but the ability to construct and evaluate expressions during the course of execution of a program can prove to be a valuable tool for any programmer.